Your kid has always been a rule follower. Even as a teeny tiny infant, you would cradle her and whisper in her ear, “Now you drift off to dreamland and sleep peacefully through the night,” and she would do it. Every single night. Any kid’s life is full of mandates: Do your homework right after school. Check! Watch your little brother on the swings. Check! Look both ways before crossing the street. Check! Share your Halloween costume with your parents. Check! Every task you’ve handed your little gal, she’s performed with flying colors; every piece of guidance you’ve gifted her, she has followed. Besides giving yourself a parenting medal (which you’ve obviously earned), you may want to pick up this Kids Police Costume for your little one. 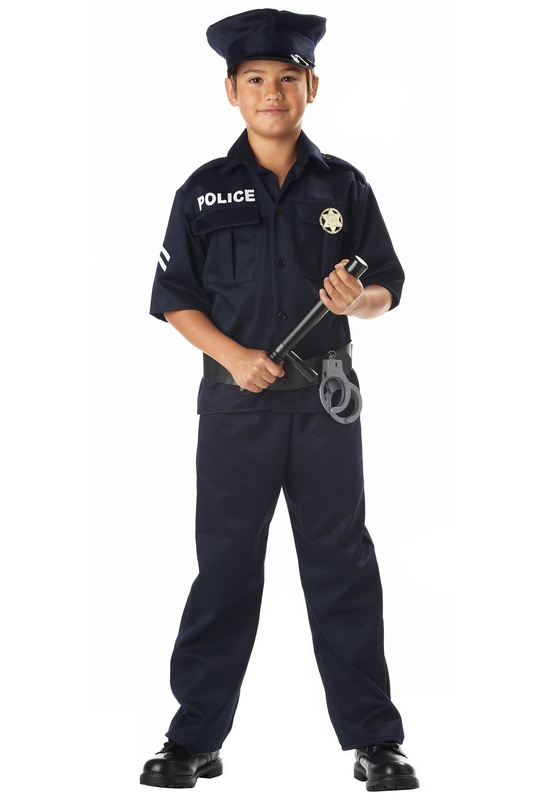 She can become one of your city's bravest icons in this realistic cop costume, and she’ll love getting to pass on her passion for following all of the rules! This pants and shirt combo comes with all the bells and whistles you’d expect, including a patch that says “Police” emblazoned on the front. The badge and plastic handcuffs are included, but she may want to add realistic accessories such as aviator sunglasses, a police whistle, or a baton to get herself fully prepared to walk her beat. Just make sure she knows it’s not against the rules to get a little muddy in this costume--play police work can be a dirty business!